So, you're thinking of inviting a few friends round for a cosy dinner on a chilly winter's evening. Lovely idea. Until you wonder where you'll find the time amidst your busy day to prepare it all, before spend hours slaving over a hot stove to conjure up a veritable feast. Then whilst you're being the perfect host, eagerly trying to partake in a bit of banter with your guests, you keep nipping back to said stove every five minutes to make sure all your culinary concoctions are going to plan. Phew! It's exhausting just thinking about it. If you're someone who prefers to entertain using as little effort as possible, then read on. What would you give for a Fairy Food Godmother to appear on your doorstep with a box full of perfectly delicious homemade dishes, all prepared and ready to go? Step forward - True Deli. Based in Earls Court, True Deli are a classy outfit and nothing is too much trouble. So when they asked me if I would like to give their Simple DIY dinner a shot, I jumped at the chance, before remembering I don't actually have space to host dinner in my simple abode, and didn't feel dining on laps would be quite as rewarding. The dilemma was short-lived as it dawned on me that I already had a dinner plan on the horizon. Some good friends of mine who live in the sticks, had invited me down for a bit of a countryside shindig at their cottage with a few others. I hastily told them about the True Deli plan to see if they were keen to give it a whirl. They were as keen as Dijon! I got straight on the blower to Henry and Alexander (the True Deli Commanders in Chief) to make a plan. A date and menu were confirmed, but then I was faced with the problem of how to cart a large cool box full of grub from London to The Sticks, as my preferred mode of transport is by rail. I came up with a great idea that perhaps True Deli could deliver the goods to Waterloo Station so I'd only have to lug it along the platform onto the train. But Henry trumped that idea and said "give us the address of your friends in the sticks, and we'll deliver it there." (He didn't actually say 'sticks' but I quite like using that reference to all my friends who live outside the M25). Bingo! Problem solved. I joined my friends for a perfectly fun and effortless weekend. True to their True Deli word, the large box of treats were delivered safe and sound (apart from a load of tricky peas who did a disappearing act en route) in a well insulated box full of ice packs to keep it fresh. The food came in well presented packaging - no nasty tin foil trays or cheap flimsy polystyrene boxes here, oh no, True Deli do it properly. There were three glass kilner jars (you know, the cool ones with the metal clippy bit) filled to the brim with fresh smoked mackerel pate, complete with a generous box of melba toast and six wedges of lemon. A giant chicken, leek and pancetta pie in a stylish white ceramic dish, accompanied by a tub of creamy mash and another with veg. A further box contained six miniature sticky toffee sponge puddings with a bottle of homemade salted caramel sauce. It's a shame a list of simple cooking instructions weren't included in the box, as after all, if you're not one to spend time preparing the food, you certainly don't want to spend time second guessing how long and what heat the pie needs cooking. Apparently they send all this via email beforehand, but for some reason it didn't reach my inbox in time, so I texted the guys for help and they got back to me immediately. After a leisurely start to the evening, we laid the table, opened the wine and waited for the other guests to arrive. Apart from wacking the pie in the oven, and boiling the veg, it was almost disconcerting how little there was to do. Which meant more time for wine and chat. Hurrah! Before long, we were all ready to tuck in. I made sure I got everyone's verdicts on the dinner, and the general consensus was a glowingly positive thumbs-up with a rating of 8/10. The mackerel pate was hugely popular and the servings were so generous, we only needed to use two of the three jars. Despite not being able to spot any sign of pancetta, the pie was so tasty that none of us could resist a second helping. The mash was also a hit, but the veg was probably the only disappointment as apart from the fact that a large portion of it escaped in transit, the helpings were quite meagre and we did have to pop to the shop for emergency broccoli supplies. Which was also a good excuse to rustle up a last minute cheese board. The sticky toffee puds were just the right size with a light texture and perfectly complemented by the delicious salted caramel sauce. We also added cream! As the evening drew to an end, we were a bunch of very happy and content diners, all in agreement that our True Deli dinner was definitely a winner! 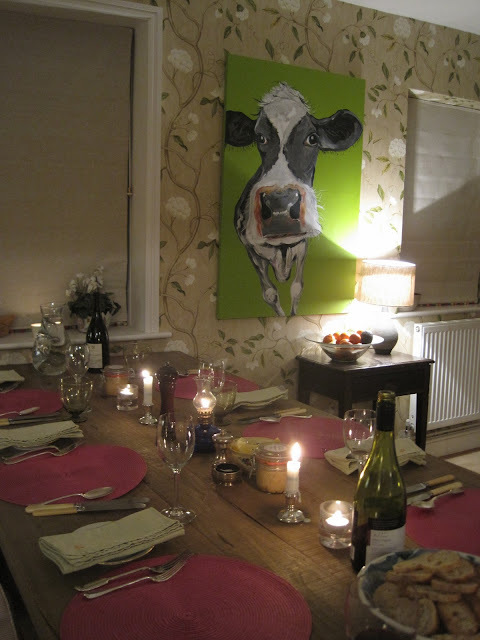 If you're thinking of hosting a dinner party, then I really suggest you try a True Deli simple dinner. At £89.50 it's not cheap, but this does include delivery (for all orders over £80). In fact if you enter the discount code: MISSIMMY at checkout when placing any True Deli order, you'll receive a 10% discount! True Deli also sell all sorts of wonderful tasty deli-ghts including chutneys, salads, hampers, breads, biscuits, cheese, salamis and olive oils. Thanks so much Henry, Alexander and The Team at True Deli. It was all really tasty, the service was amazing and you're already a big hit in The Sticks. Sounds great, I'm definitely going to give them a go! I was the Domestic under the impression that Miss Immie was Goddess that produced the delicious supper that I was asked to attend in the "Sticks," She appeared unflappable, very relaxed and produced a delicious supper in such a calm and serene manner but now I know that it was True Deli...Well..I can only say I recommend them very highly......absolutely scrumptious "Homemade Country Fare"!! We had a great evening and I think, I too may have to "Cheat" a little and order that delicious Mackeral Pate for my next glittering soiree...Yes even in the Sticks. Thank you Immy and thank you True Deli. Claire. Last night my girlfriend and I used True Deli and got their Valentine's Day meal for 2. The meal was great. Delicious food that had been nicely prepared and boxed up. Delivery was on time and they managed to sort me out with this service even though I'd left it really late to order. Top food, top guys and a top recommendation, as always, from Immy. looks absolutely delicious will have to check those out next year!